We all have days when we feel we're burdened with work and unappreciated for the effort that we put into meeting deadlines. If you are one amongst those who is under constant unrelenting stress, feeling helpless and often worn out, you may be suffering from a "Burnout". "Burnout is a state of mental, physical and emotional exhaustion caused by prolonged and excessive stress". It usually occurs when you feel besieged and unable to meet constant demands of your job. This is known to reduce productivity, drain out all your energy, leave you feeling resentful, cynical and very hopeless. Burnout can affect every area of your life including your social and personal life further causing long-term changes which can make you susceptible to illnesses. As it has an effect on every aspect of your life, it's important you deal with a burnout at the right time. There is no one particular cause for burnout. 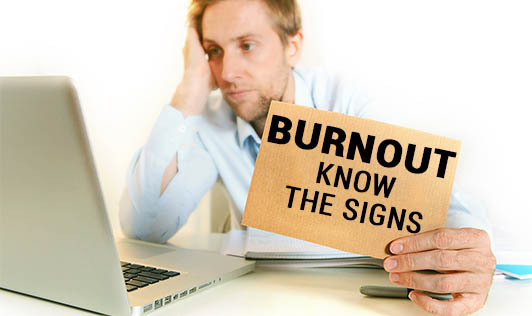 It can be work, lifestyle or personality traits that can contribute to burnout. Slow down and begin your day with a relaxing ritual. Eat healthy, exercise, and get the right amount of sleep. Re-evaluate your priorities and goals. Adopt the 3 "R" approach: Recognize the signs of burnout, Reverse the damage by managing stress and seek support if essential, build your Resilience to stress by taking care of emotional and physical health. Schedule a regular time during the week to relax. Burnout doesn't happen overnight, it is a gradual process that occurs over an extended period of time. So, pay attention to the warning signs, which will help you prevent a massive breakdown or if you choose to ignore it then you'll eventually BURN OUT!